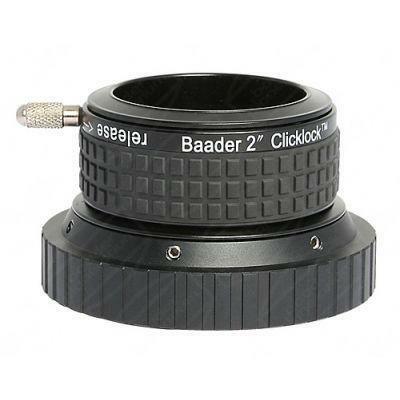 This Baader 2" Clicklock Adapter is designed specifically for all Telescopes using the Large 3.25" SCT Thread. Gives a full 2" aperature. The Baader 2" Clicklock Adapter locks eyepieces and accessories into place with a simple twist. So strong they can literally support an entire telescope without slippage! 20 degree Rotation is all that is required. Very low force required to rotate. Absolutely no sag or misalignment, even for heavy and long accessories. Versions to fit most popular telescopes.